OneDesk’s help desk application makes it easy for support teams to quickly manage and solve help desk tickets, automate their processes, and develop stronger relationships with customers. How is OneDesk’s help desk software different from others? The help desk application is linked to a customer portal, which customers would use to submit feedback, ideas, problems and questions to your organization. Just send customers the link, or embed it in your website. This eliminates the need to manually gather items from emails, phone calls, and surveys. When customers submit problems or questions via the customer portal, your company will immediately receive them in OneDesk’s help desk application. Customers can also email issues to your dedicated OneDesk email addresses. You can also forward your support email to these addresses. OneDesk’s social media monitoring application is connected to all other applications, including the help desk app. Discover issues and problems by tapping into conversations on the social web. Easily turn Facebook posts, tweets, blogs and comments into tickets by tagging them as a problem or questions. Once tagged, they will appear in OneDesk’s help desk app. Once in the help desk application, you can quickly resolve tickets by engaging in one-on-one discussions with customers or open them up to discussion by the community. One unique feature is that OneDesk’s allows you to automatically keep customers updated on the status of their tickets and feedback. Simply update the lifecycle status in your OneDesk account. 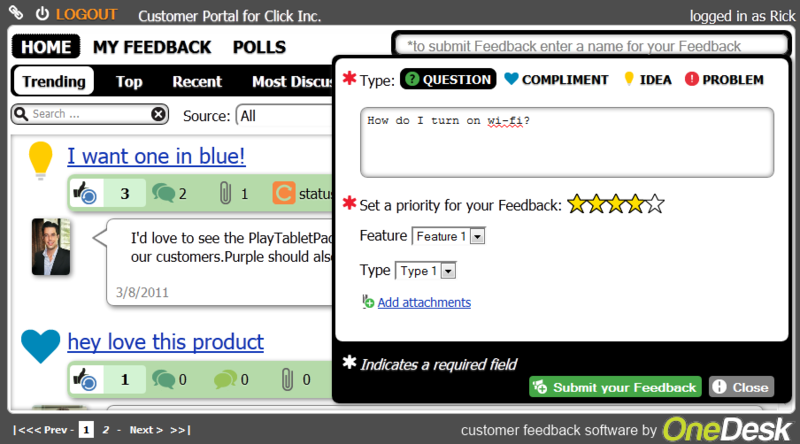 OneDesk’s powerful automation engine allows support teams set up auto-response emails to customers who submit feedback.